Minard, Charles Joseph / Gravée par Regnier et Dourdet / Lith. 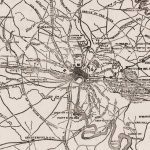 Gratia, CARTE figurative et approximative de Coton et laine importees en Europe en 1858 et en 1861. Paris, July 26, 1862. Lithograph, 21”h x 34 ¼”w at neat line plus margins, original wash color. Signed by Minard in ink at lower right. A great rarity of thematic mapmaking: a Charles Joseph Minard “flow map” tracking the impact of the American Civil War on the global cotton trade. 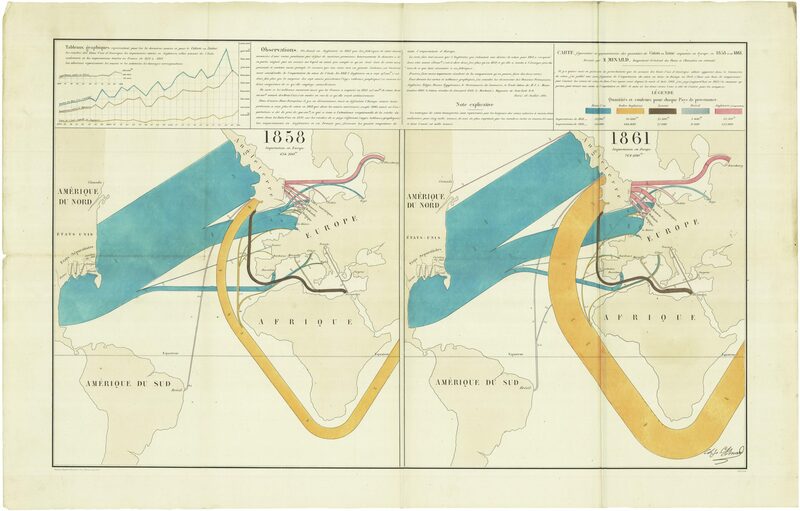 Minard was one of the great 19th-century innovators in what Edward Tufte has called the “visual display of quantitative information.” Over the course of a quarter century he produced dozens of stunning maps addressing different elements of economic geography, usually involving the movement of goods and/or people through space. Offered here is one of his relatively few maps to depict an American subject, and a vital one at that: the impact of the Confederacy’s “cotton diplomacy,” its attempt to use an embargo on cotton exports to force intervention by European powers in the Civil War. Minard’s career may be viewed as having two distinct phases, his decades as a prominent civil engineer clearly laying the groundwork for his second act as a “visual engineer.” (Friendly, p. 33) Born in Dijon in 1781, he received a top-drawer education in mathematics, science and engineering, first at the École Polytechnique and then at the École Nationale des Ponts et Chaussées, the training ground for the engineers responsible for building and maintaining France’s infrastructure of ports, roads, canals and railroads. He spent the better part of a half century with the Ponts et Chaussées, the first 25 or so working primarily on canals and related projects. In 1830 he was named superintendent at the École Nationale, in which role he served—while also performing teaching duties—for the next six years. During this time he developed a deep interest in railroads and traveled widely to develop material for his curriculum. In 1839 he was promoted to “divisional inspector” within the Ponts et Chaussées, and in 1842 he was freed from teaching, but the required travel was a burden due to his ill health. Rather than leaving the service, however, in 1846 he received an appointment as one of seven Inspectors General of the Ponts Et Chausée and a member of its governing council, which directed all work of the department. He finally left the department in 1851 after reaching the mandatory retirement age of 70. In March 1845, while still at the Ponts et Chaussées, Minard had published his first thematic map, “a relatively crudely drawn flow map of the movement of travellers in the region from Dijon to Mulhouse” (Robinson, p. 98). In all he is credited with dozens of such maps depicting statistical data in graphic form, the vast majority produced in the nearly two decades after his “retirement,” usually at a rate of several per year. 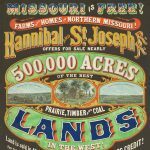 Most bear a title beginning with the phrase “Carte Figurative et Approximative,” roughly, “Figurative and Approximate Map,” a clear signal that their intent was thematic rather than purely geographic. Many of these Cartes Figurative et Approximative are what Robinson calls “flow maps,” in which “the width of a flow line… is always strictly proportional to the magnitude it represents.” (Robinson, p. 95) It is worth noting that, while Minard is by far the best-known maker of such maps, the technique was pioneered by one Henry Drury Harness, on an 1837 map of Ireland. Minard’s maps covered a huge range of subjects, though almost all related in some manner to the movement of goods and/or people: the export of coal from England; shipments of French wine by sea; numbers of rail passengers across Europe; imports of cotton and linen to Europe before, during and after the Civil War; and of course his famed maps of the campaigns of Hannibal and Napoleon. Minard’s influence in France was such that “from about 1850-1860, all Ministers of Public Works in France had their portraits painted with one of Minard’s creations in the background.” (Friendly, p. 33) Though Robinson estimates that his maps “were published in editions of a few hundred to perhaps a thousand copies and apparently were widely used in official circles,” they are today sought-after rarities on the antiquarian market, particularly those with strong American content, as the example offered here. By the outbreak of the Civil War the American South was by far the most important producer of cotton, the key ingredient in the world’s single most important industry. One author, for example, cites estimates that it supported the livelihood of 20 and 25% of all people in Britain, attracted 10% of all British capital, and yielded 50% of all British exports. (Beckert, p. 1408) In August 1861 the Confederacy sought to exploit this fact by placing an embargo on cotton exports, with the goal of compelling cotton-dependent European countries—England and France in particular—to recognize the Confederacy and even intervene to break the Union blockade of its ports. What the Confederacy failed to take into account was the surplus of cotton in European warehouses (nearly 600,000 bales!) and, above all, the flexibility of British capitalists and Indian and Egyptian growers, who together combined to rapidly develop alternative sources of production. This remarkable map by Minard documents the early effects of the Confederacy’s cotton diplomacy and hints strongly at the strategy’s ultimate failure. The image features two identical base maps of North and South America, Europe and Africa, that on the left representing the year 1858 and that on the right 1861. In the United States the seceded states are named and shown in outline—with the odd exceptions of Arkansas, North Carolina, Tennessee and Virginia! Across the Atlantic some 17 cities somehow involved in the cotton trade are identified, from Alexandria to Barcelona to St. Petersburg. 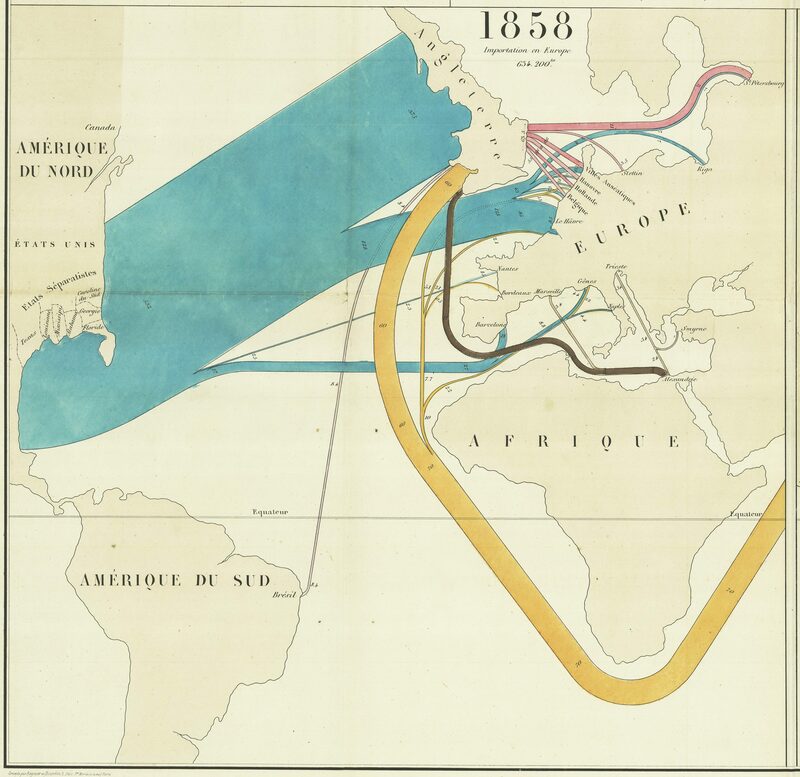 As usual on Minard’s flow maps, coast lines have been distorted as necessary to accommodate the heavy “streams” used to represent economic data, in this case volumes of cotton and linen exported and imported. 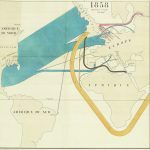 Minard uses color coding to indicate country of origin: blue for American, yellow for Indian, brown for Egyptian, gray for Brazilian, and pink for re-exports from England to the Continent. This map was originally owned by railway engineer François Prosper Jacqmin (1820-1889). He worked for the Paris and Eastern Railway Companies, before becoming a professor at the École des Ponts et Chaussées in 1864. 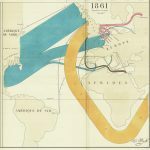 During the course of the Civil War Minard published additional maps tracking the rapid evolution of the cotton trade, in particular the collapse of Confederate exports and the rise of Indian and Egyptian producers, including this map contrasting the years 1858, 1864 and 1865. Rare Book Hub lists no examples as having appeared on the market, though one was sold by the firm of Daniel Crouch Rare Books in the past year as part of a large Minard collection (Catalog XV, #12). Though Minard was prolific, all of his works are extremely rare. 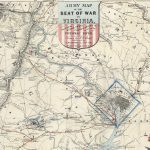 Rare Book Hub lists only 11 books and maps as having appeared for sale, none with American content, all sold between 2003 and 2014. Robinson, Arthur, “The thematic maps of Charles Joseph Minard,” Imago Mundi, vol. XXI (1967), #30. Rumsey #10135. 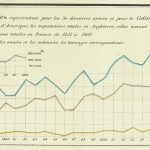 As of February 2018 OCLC lists impressions only at the Bibliotheque nationale de France and the Library of Congress. See the Robinson article for excellent background on the life and work of Minard, as well as Michael Friendly’s “Visions and Re-Visions of Charles Joseph Minard,” Journal of Educational and Behavioral Statistics vol. 27 no. 1 (Spring 2002), pp. 31-51. For a much briefer, more popular treatment, see Betsy Mason, “The Underappreciated Man Behind the Best Graphic Ever Produced,” National Geographic web site, March 16, 2017. That article also provides a link to a short-but-sweet Youtube video describing Minard’s cotton maps. For background on “cotton diplomacy” during the Civil War, see Beckert, Sven, “Emancipation and empire: Reconstructing in worldwide web of cotton production in the age of the American Civil War,” American Historical Review 109(5): 1405-1438. Old folds, a bit of soiling, and a couple of small mends, but very good or better.